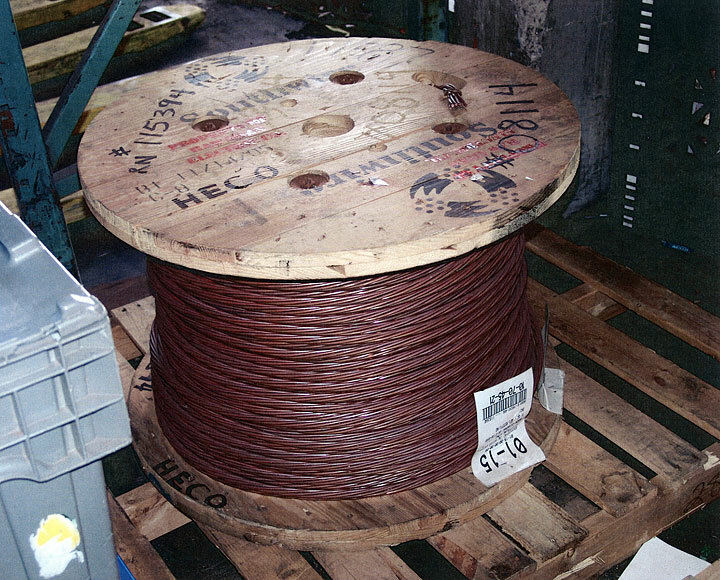 Undercover police went to a scrap metal dealer yesterday with the bait: a spool of 653 pounds of copper wire labeled "HECO," valued at $3,334. "We told them it was stolen from Hawaiian Electric, and they purchased the item anyway," said Kalihi police Maj. Kurt Kendro. Police arrested a 44-year-old employee of Aiea Recycling, at 1811 Dillingham Blvd. in Kalihi, for allegedly accepting the purportedly stolen spool of wire, and four prior violations of the law governing scrap dealers. The employee, Kyung Hee Chon, was charged last night with second-degree theft, a Class C felony, and the four violations. Her bail was set at $50,000. Aiea Recycling's owner could not be reached for comment. In the past year, police have made many arrests for copper thefts, a burgeoning crime that is costing hundreds of thousands of dollars in losses. But yesterday's is believed to be the first local arrest of someone for allegedly purchasing stolen copper. Aiea Recycling was one of four Kalihi copper recyclers that police investigated yesterday. Six Kalihi recyclers have been investigated since November, police said. In addition to the Aiea Recycling arrest, officers also arrested a 58-year-old employee for an alleged violation of the scrap dealer law at Island Recycling yesterday. Police did not specify what that violation was. The employee, Taufaasulu Pulou, was charged yesterday and posted $2,000 bail. The owners of Island Recycling could not be reached for comment. The other four recycling companies had technical violations but nothing that led to arrests, police said. Copper theft is increasing on Oahu and nationwide because of the high price of the metal. On Tuesday, copper thieves ripped out 40 feet of copper wiring from nine Hawaiian Electric Co. poles in Kalihi. And over the Presidents' Day weekend, three copper downspouts were stolen from a Mililani church and copper wiring from Leilehua High School. Since 2006, when recyclers were paying $3 a pound for copper, thefts have plagued the island with more than $760,000 worth of copper alone, not including replacement or labor costs, Kendro said. So Kalihi police launched "Operation Full Copper Jacket," a three-month investigation targeting recyclers, whom they believe are the possible sources of money fueling the thefts. Police want dealers to know they are watching them and running undercover operations. Their message to dealers is, "Don't buy stolen copper," Kendro said. "If thieves can't sell stolen copper, they can't make their money." "Thieves have to sell this copper someplace, and there's a limited number of copper recyclers on the island, so we want them to follow the law and support legislation to police their own business," 13 islandwide, Kendro said. Thieves sell the copper to recyclers, getting $1.60 to $2 a pound, for quick gratification, Kendro said. That is why police support legislation for a 45-day waiting period before the seller receives money from a sale. HECO has had 10 incidents of copper thefts this year, with losses in the tens of thousands of dollars. Last year, there were 22 incidents totaling hundreds of thousands, said a HECO spokesman. The police had also gone to the dealers, explaining laws governing scrap dealers. Dealers must obtain a written statement signed by the seller certifying he lawfully has the right to sell it. They must obtain name, address, occupation, description of items, amount, vehicle license number and proper identification. Numerous bills propose tougher copper theft laws, including creating a specific felony offense of copper theft and special requirements for copper purchase by scrap dealers and to hold the dealers accountable. They include requiring sellers to be fingerprinted and providing a government photo ID, photographing the copper being sold and recording all sales.